In Andorra the natural heritage always has a cultural component: interaction between man and his environment is a constant factor. This is one of the great attractions of nature in the country: the dialogue between the majesty of the Pyrenees and the efforts made by man in order to live here. In the parish of Andorra la Vella there are many itineraries in the mountains to be enjoyed, with various degrees of difficulty. The Parc Central, a green area spread out over 33.000m², making it the biggest green lung in the capital, sits in the heart of Andorra la Vella, next to the Valira River. 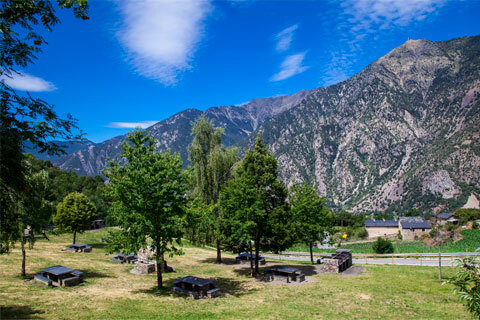 With an area of more than 16,500 m2, the picnic area is an ideal setting for a barbecue with family or friends, with the panorama of the sunny side of Andorra in front of you. 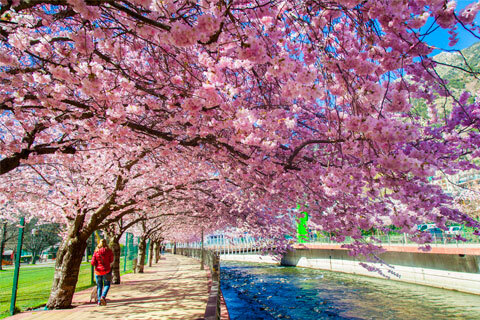 The Passeig del Riu, or River Walk, runs through the city, parallel to the Valira River. It is a pleasant route both for walking and for running, as a stretch of it is paved specially for runners. The start of the walk is located in the Parc Central and it finishes in Santa Coloma. 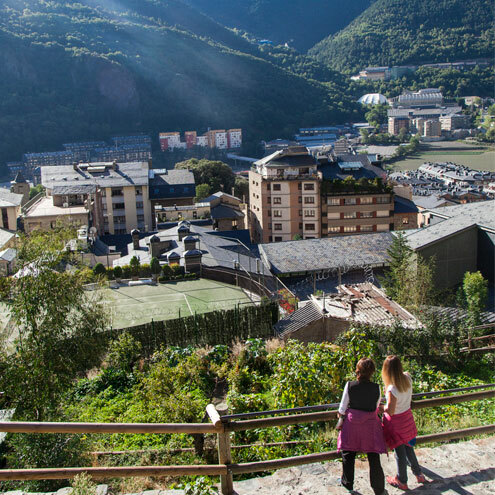 On one of the slopes of Andorra la Vella, we find the Rec del Solà, a space for sport, walking or taking in the views of the parish at its large viewpoint. This is a 4km linear walk (there and back) that passes along a little irrigation canal built in 1880, which was used to water the orchards located on the slopes and runs from the Col·legi de Sant Ermengol to Santa Coloma. It is a paved path and perfect for a pleasant, relaxed morning walk with family. From Santa Coloma, heading towards La Margineda on traditional trails, walkers can see the Torre dels Russos tower and the archaeological settlement of Roureda de la Margineda. 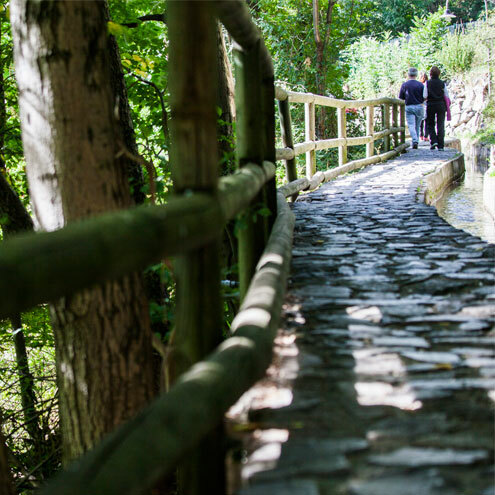 Further to the south, you will find the Pont de la Margineda bridge, then, a bit further on, Balma de la Margineda, which was home to the first inhabitants of Andorra 12,000 years ago. 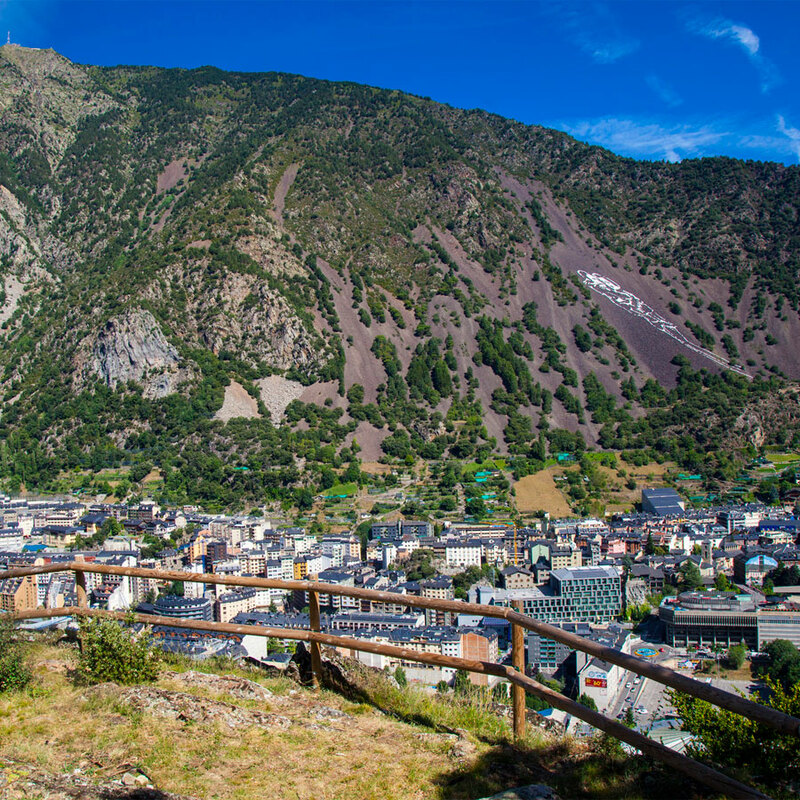 The Mirador de la Comella is one of the most symbolic and picturesque spots in the parish of Andorra la Vella. It is the perfect place to enjoy the beauty and biodiversity of the surrounding area and take in the spectacular views. This viewpoint is ideal for getting out your camera and immortalising the breathtaking scenery around you, including some of the country's most incredible peaks, such as the Pic de Carroi in the foreground (2,334 metres), the Pic de les Fonts (2,748 metres) and the Pic del Pla de l'Estany (2,859 metres). What's more, an information panel will introduce you to the area's plant life. With a bit of luck, you might glimpse some of the local wildlife, which also appears on the information board. 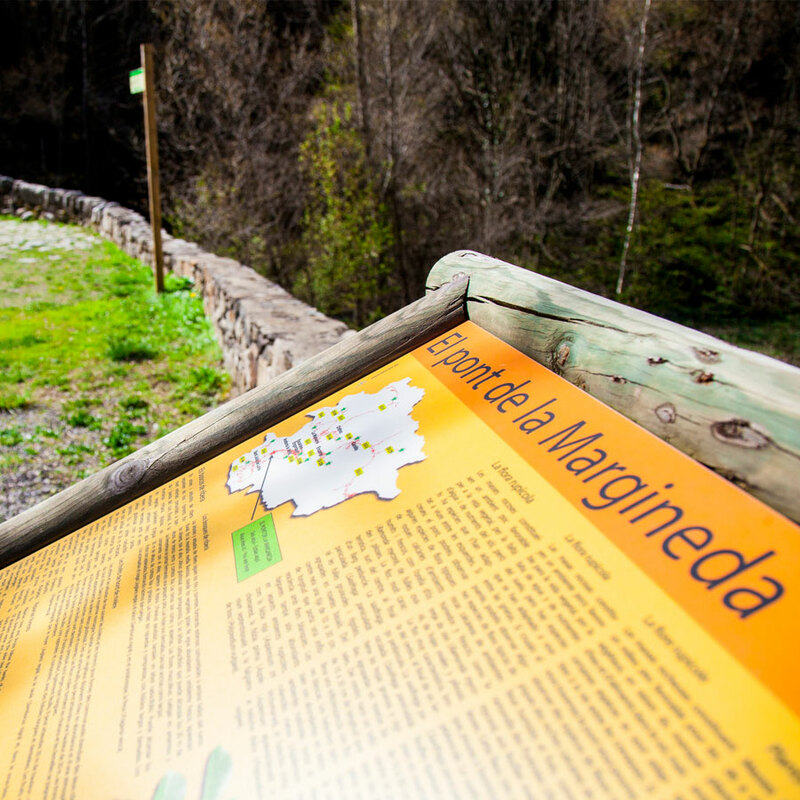 The viewpoint at the Pont de la Margineda is the ideal spot to discover the riparian forest, where the main trees are the alder and the common ash tree, which can reach a height of up to 30 metres. You can also observe how nature has had to adapt to a lack of water and sun as you take a closer look at the flora growing on the rocks, where three types of fern are abundant: maidenhair spleenwort, northern spleenwort and bracken. The plant life is not the only attraction on offer; visitors can also spot a variety of river birds, like the white wagtail, which is usually found singing on the rocks in the stream, and the Eurasian wren, which prefers to sit in the bushes. In the winter, you can even see the migration of the great cormorant. 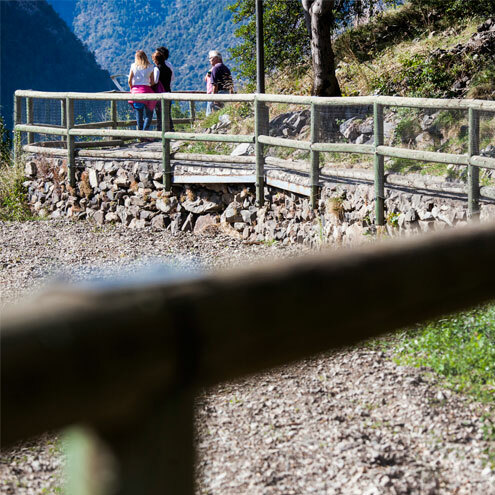 The Roc de Senders viewpoint, accessible from Rec de l'Obac or Els Serradells sports centre, offers spectacular views of the Andorra la Vella valley and Santa Coloma, from the shaded slope. 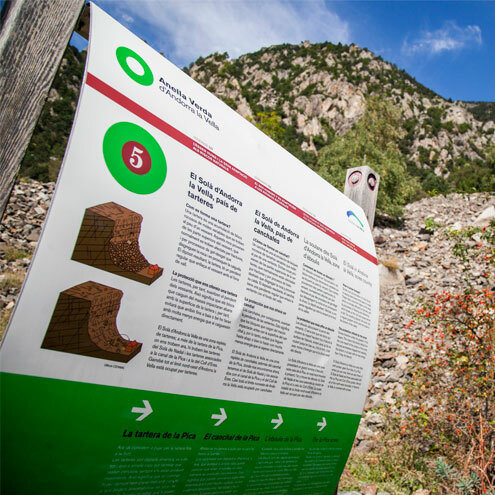 One of the ways into the nature area of Madriu-Perafita-Claror, declared heritage of humanity by UNESCO in 2004, is from the Obac or shady side of Andorra, by well signposted paths leading up to Prat Primer and the pass of La Caülla, through the woods of Palomera. 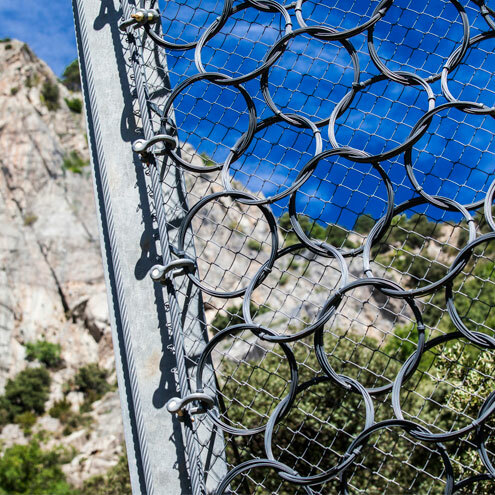 The protected area, which is shared between four parishes (Sant Julià de Lòria, Andorra la Vella, Escaldes-Engordany and Encamp), is a magnificent example of the natural and cultural environments in the mountain ecosystems. This route begins on Carrer dels Barrers in Santa Coloma then, along the scree, heads towards Collet de Sant Vicenç. The track then continues towards the left, past the pre-Romanesque Sant Vicenç Church and the archaeological area of Roc. On the right, the path continues straight towards the mountains, through a wild valley, ideal for spotting birds of prey and large local mammals: izards, European roe deer and wild boar. The Vall d'Enclar is one of the areas in Andorra with the biggest population of izards. If you visit at the very beginning or end of the day, you might see one. Otherwise, you can look for traces of them, like footprints or excrement. 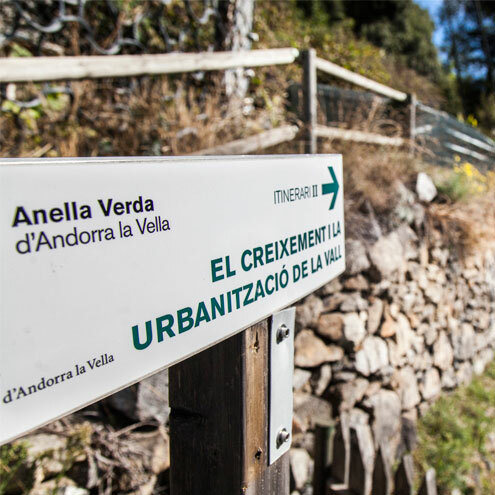 The Anella Verda is a natural trail that surrounds the urban agglomeration of Andorra la Vella. 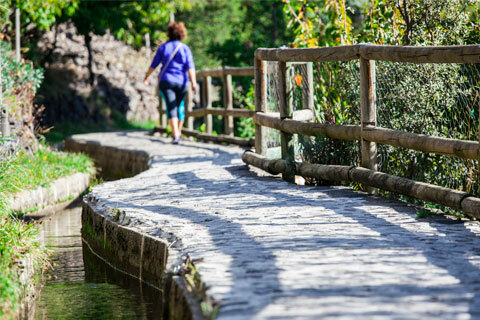 It is an easy walk with few uphill parts, made up of the Rec del Solà, Rec de l'Obac and various areas of historical, natural and cultural interest. The route passes through scenery that tells the story of local resources and society over history, and shows how the parish has evolved and how its urban layout has been organised. 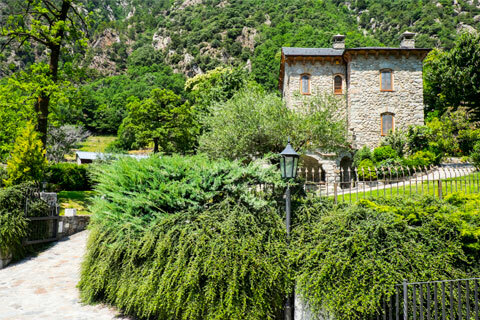 It includes several signposted routes so that you can discover the geology surrounding you and its relationship with urban centres, Andorran Romanesque architecture and the rural scenery. The Rec de l'Obac stretch covers the most wooded area of the route, as well as the orchards and tobacco crops, while the Rec del Solà part offers the perfect viewpoint over the valley, from where you can take in the parish's scenery. There are several signposted routes. On the left bank of the Prat Primer River and 2,235 metres up, between the Prat Primer mountain pass and Els Graus, we find the unguarded Prat Primer shelter. This stone shelter, opened in 1981, is open all year (but only maintained in the summer) and has bunks for 6 people, a fireplace and water. There is also mobile phone signal in the area. To get there, go to La Comella by car, then follow the La Plana path for 2 hours. 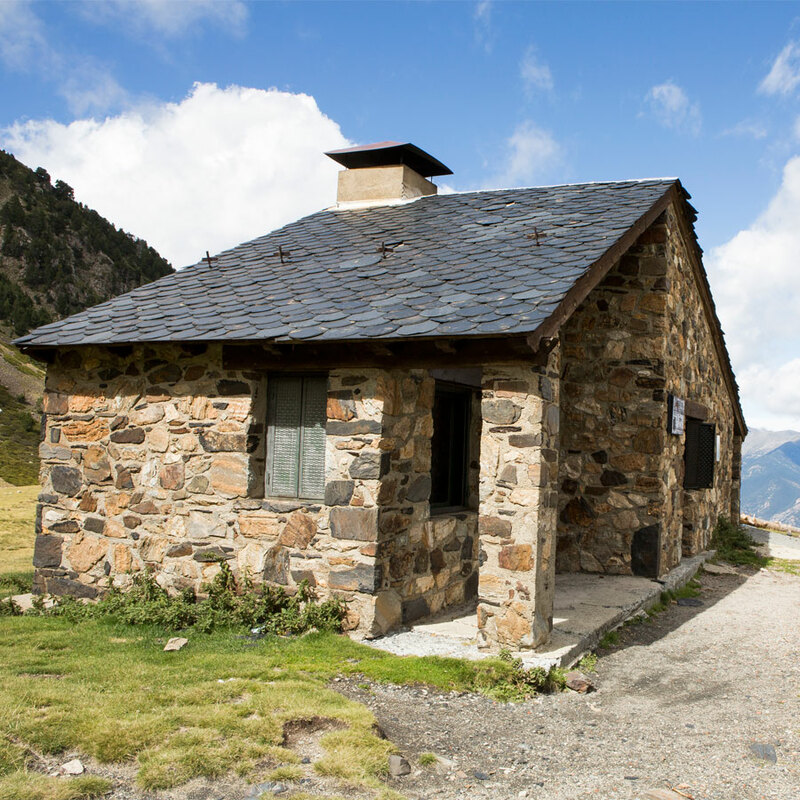 Download the map of the shelters and paths of great length in Andorra. The fishing season in Andorra begins in mid-March and finishes in mid-November. Whether you are looking for controlled fishing, more intensive fishing or catch and release areas, Andorra offers the opportunity to enjoy a relaxing day out fishing surrounded by nature's beauty. From Andorra la Vella, there is a route that takes you to the Estany de la Nou lake, where fly fishing is very popular. Please remember, however, that recreational fishing requires a licence in Andorra. 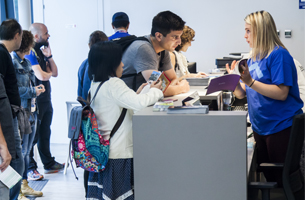 A seasonal licence can be obtained from the Govern's administrative building (c/Prat de la Creu, 62, Andorra la Vella), or a tourist licence can be requested from any tourist office or other authorised entity in Andorra. 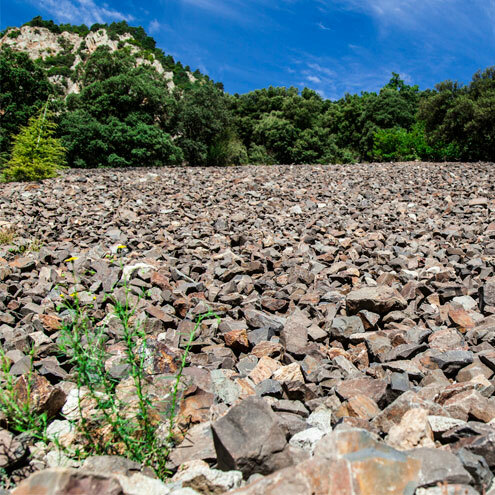 A short itinerary inside the Rec del Solà area, included in the Anella Verda project, to find out about farming and stockbreeding values, as well as the irrigation channel as a major example of the mastery of water. 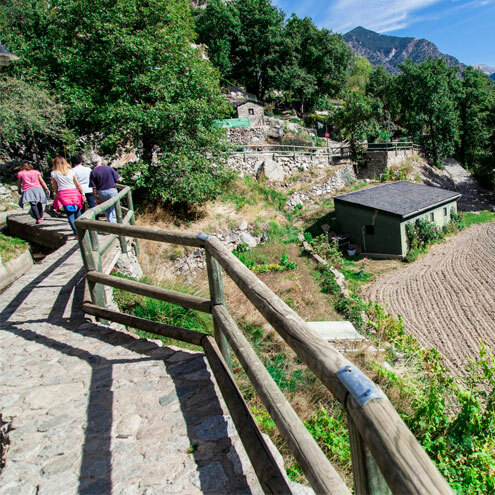 An itinerary connecting the Rec del Solà irrigation channel with Andorra la Vella historical centre. Start: Font del Puial path. An itinerary that helps you understand how human beings have adapted their lives in the face of natural risks. 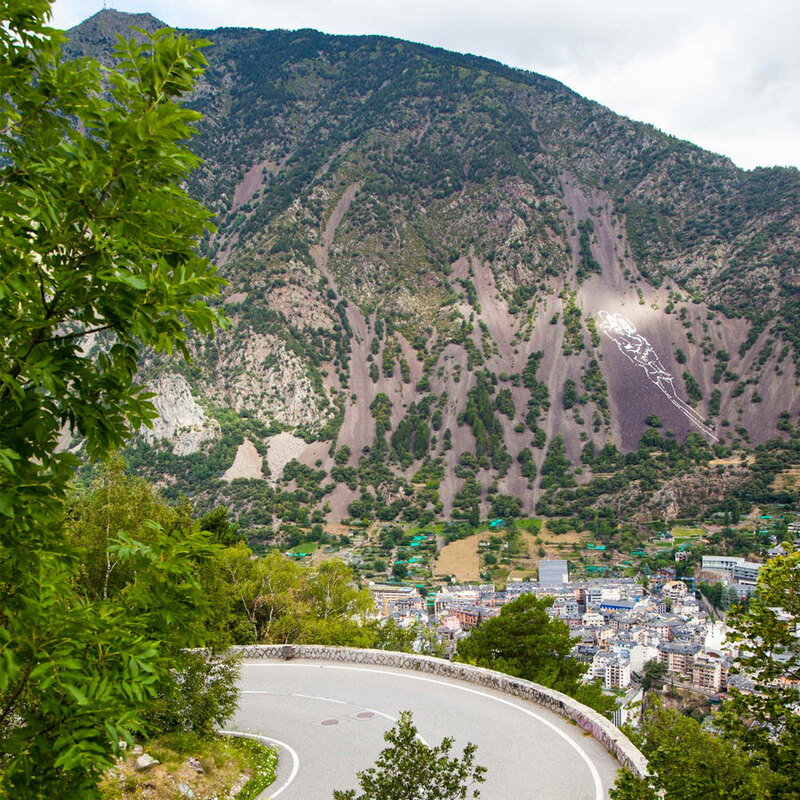 The Rec del Solà is one of the two slopes of the Anella Verda and one of Andorra la Vella's green lungs. This is a pleasant walk heading down through a large viewpoint that begins at the Saint Ermengol plateau and stretches almost to Santa Coloma, ideal for a morning walk with family. This area is dominated by the ruggedness of the Enclar mountains (these are steep and full of scree, with vegetation that clings to the rocks), making it the ideal spot to appreciate the vast botanical and geological variety of the mountains, see how the water runs into the irrigation system, and admire the Sant Antoni de la Grella Chapel and the Sant Antoni Romanesque bridge. You can even stop for a break a few metres above the irrigation canal at the picnic area with a breathtaking viewpoint. There are three self-guided tour routes on this path, based around the agricultural transformation of the valley, the growth and urbanisation of the valley, and human beings and how we adapt to natural risks. Start: end of the Les Canals street. Finish: end of the Les Canals street. Altitude difference: +185 m / -192 m .
Season: End of June until the end of September. The Vall d'Enclar route begins in the centre of Santa Coloma. The starting point, a picnic area, is dominated by elders, cherry trees and blackberry bushes, as well as animals typical of the land near urban centres. The trail goes straight up between ash trees, Scots pines, evergreen oaks and walnut trees, and lizards can be found under the rocks. The Enclar path is also one of the best places to spot birds of prey, especially in migration season, as there are open stretches of granite scree. You might spot some black kites, griffon vultures, etc. If you walk the route early or late in the day, you increase your chances of seeing European roe deer, izards and wild boar. When you arrive at the end of the route, you will walk back to the beginning along the same path. Start: Barres Street, 40 (42° 29' 46",01° 29' 47"). Finish: Barres Street, 40 (42° 29' 46",01° 29' 47"). Altitude difference: +392 m / -43 m.
This is a humid area with dense vegetation that is home to aspens and some whitebeams, rowans or mountain-ashes, and silver firs. This trail is also full of asarina (an interesting species, as it is endemic to the Pyrenees). Upon arrival at La Comella, take in the spectacular panoramic views over the city of Andorra la Vella. Start: Picnic site at La Comella (42° 29' 54",01° 31' 49"). Finish: Picnic site at La Comella (42° 29' 54",01° 31' 49"). Altitude difference: -199 m / -188 m.
Discover a wealth of outdoor routes, with offline maps and detailed GPS tracking. Plan your mountain activities now! The safety application that in the event of emergency allows users to send their exact location to the rescue teams.